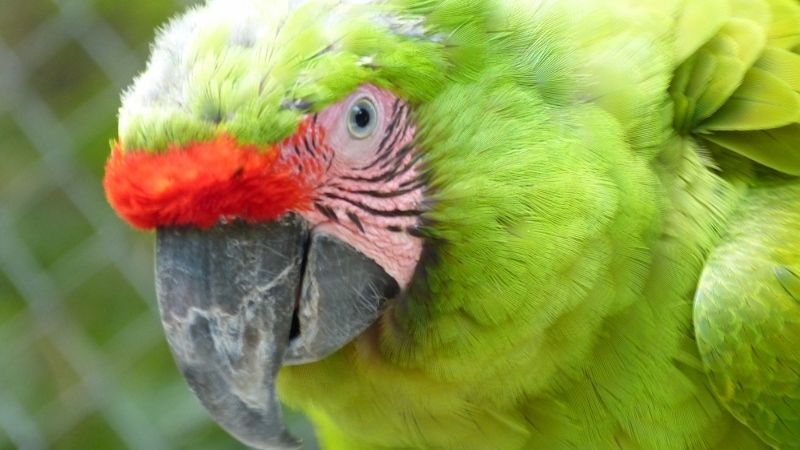 Two species of macaws, large parrots of the genus Ara, are found in Nicaragua. The Great Green Macaw (Ara ambiguus) is limited to extremely humid areas with abundance of a particular tree, Dipteryx panamensis, and it is only found from Mexico to northern South America. The bird is big and noisy and flies above the canopy while screaming, bringing ample attention to it wherever it goes. 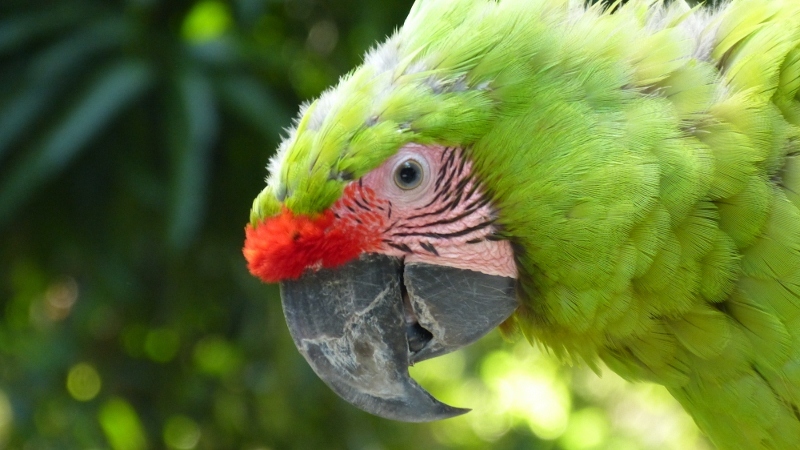 As a result, its population has been severely affected by commerce in macaws as pets. Today, only about 2500 adult birds are left in the wild, the majority of them in the Rio San Juan area of Nicaragua. 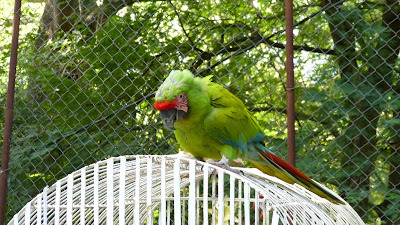 Bumbelina is a Great Green Macaw. Photo by Hans Rademaker. The birds are heavy, strong, and have large, piercing claws and beaks that can sever a finger. 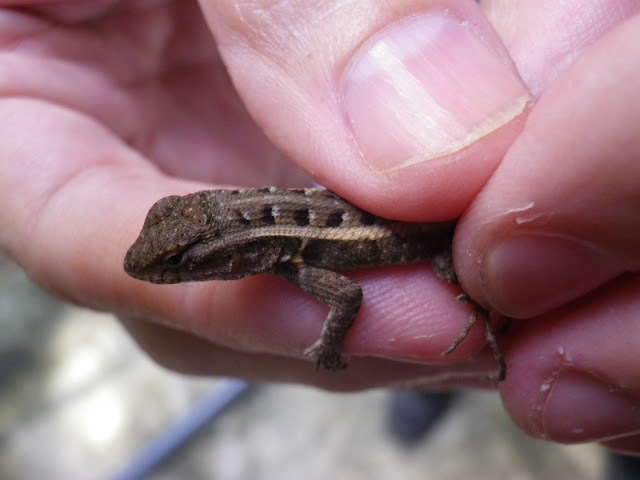 Handling them requires rough treatment if they are wild. Sadly, these birds are pursued for the pet trade so vigorously that broken wings and legs do not deter the pet traders from ravaging the forests. Bumbelina sits atop her cage. Photo by Hans Rademaker. The Great Green Macaw is the largest of all the macaws. Like all others, Bumbelina "walks" on three points, using her beak as a third appendage when climbing on any but the flattest of surfaces. 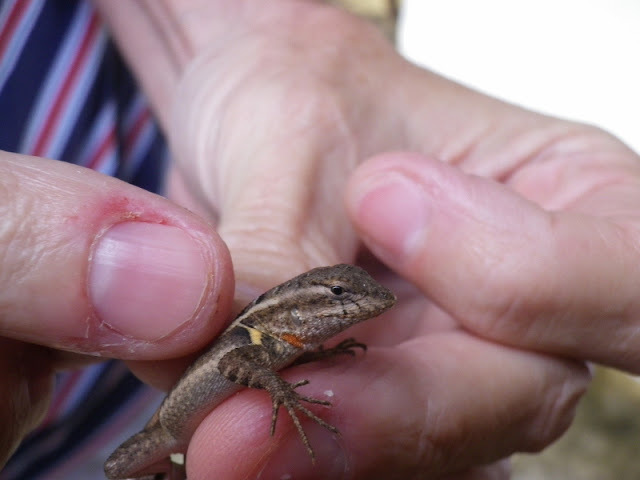 Her splendid colors include bright red, baby blue, maroon, and lots of green. When excited, the light pink skin exposed on her face flushes to bright red. The Great Green Macaw is the most endangered of the macaw species found in Central America. Photo by Hans Rademaker. The association between this species and the river almond tree Dipteryx panamensis is remarkable and problematic. Not only are these birds pursued for the pet trade, the tree with which it associates is harvested for its fine wood. The trees remaining in Nicaragua Because so few birds remain in the wild, and because the habitat and the birds themselves are under severe, direct threats, the Great Green Macaw is now listed as Endangered. The Great Green Macaw loves to climb. Photo by Hans Rademaker. 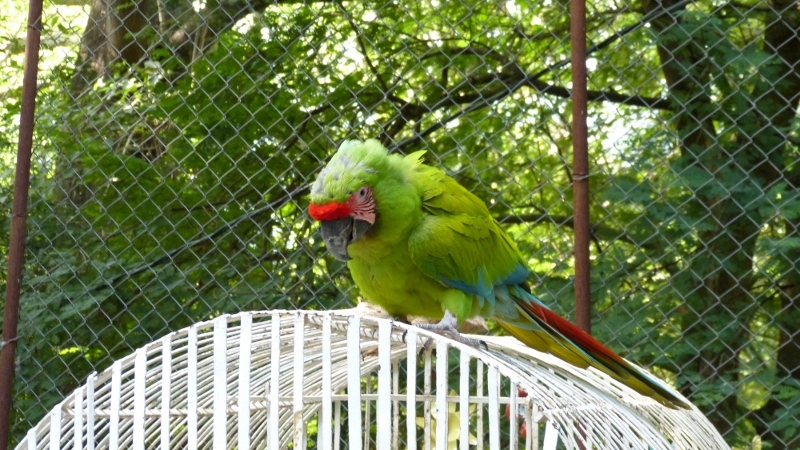 Bumbelina came to us accompanied by a Scarlet Macaw (Ara macao), named Midorna. 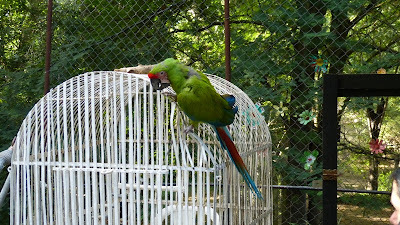 These birds are rescued from the pet trade in Nicaragua. Midorna is considerably more sociable than Bumbelina, and she allows brave people to touch her, sometimes. She, too, was captured in the wild and subjected to the trade in wild animals as pets. Captivity has also been very unfortunate for her. She has a broken wing which prevents flight, so she, like Bumbelina, will never return to the wild. Life in a cage has led to self-destructive behaviors, too, such as feather-plucking. She has eliminated many of the feathers on her breast and back, and she has begun to do the same to Bumbelina. This is a typical pathology of animals kept in captivity without sufficient recreation. Midorna is a female Scarlet Macaw, now residing at Estacion Biologica Laguna de Apoyo. Photo by Hans Rademaker. Their calm demeanor and spectacular plumage make the Scarlet Macaw highly prized as a pet. As a result, these birds no longer can be found over almost all the Pacific region of Nicaragua, where they are native. 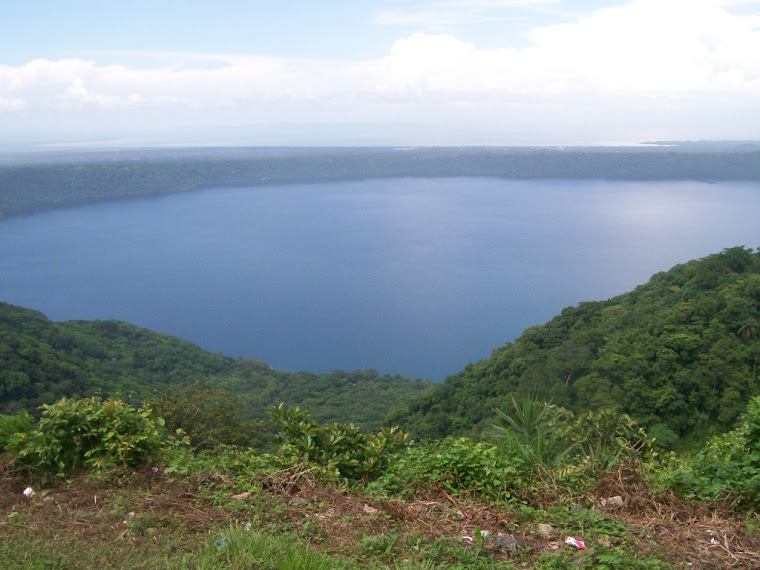 The last bird regularly seen in Laguna de Apoyo Nature Reserve was in 1969, according to the consensus of older residents. The Scarlet Macaws were either captured for use as pets, or killed for their aptitude as crop pests. Macaws can eat a lot of corn in the field! No one thought, just a few decades ago, that these majestic birds would never again fly over the cities and countryside of western Nicaragua. The Scarlet Macaw is no longer found in most of the Pacific region of Nicaragua, thanks to hunting and the pet trade. Photo by Hans Rademaker. Don't be a part of the problem. Macaws are not entirely domesticatable animals. If set free in a setting with abundant food available, they rarely return willingly. 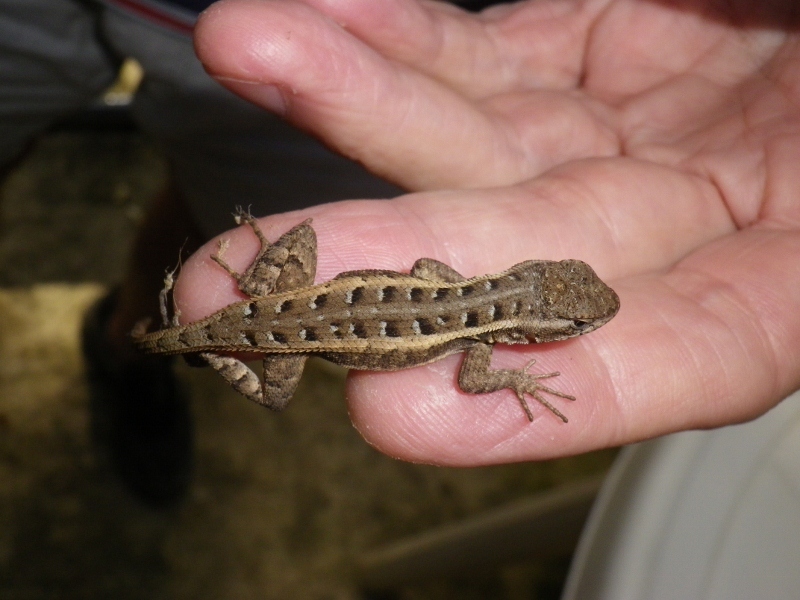 Even hand-raised birds from captive-breeding programs will readily go wild if permitted. These birds want to be free, and whenever feasible, they should. 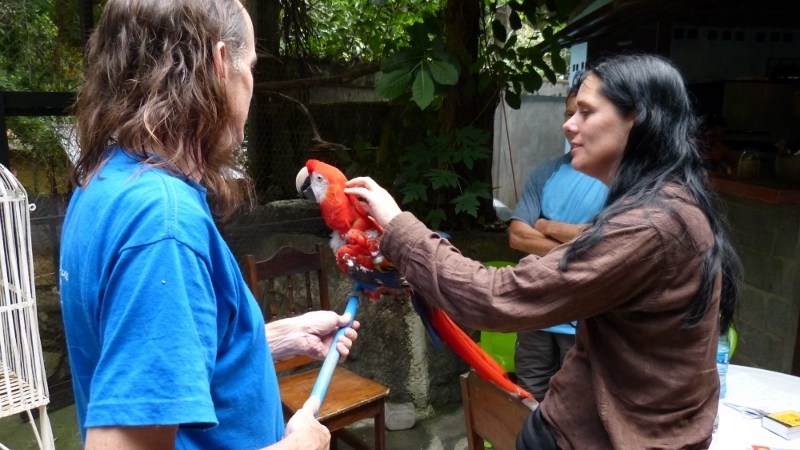 Most of the macaws treated as pets in Nicaragua are owned by wealthy people, especially non-Nicaraguans, who propel the illegal trade in these animals. The macaws found in the pet trade or their progenitors were the victims of poorly established or enforced laws regarding poaching and the trade in wild animals. However, better procedures for enforcing environmental laws are now operating throughout the ranges of the macaws. Active monitoring of many macaws populations are now underway, as well as environmental education programs. Forests are protected against habitat destruction as well as poaching, better than at any time in the past. Some of the forests could be inhabited by macaws, if only there were a program to reinstate them into natural areas. 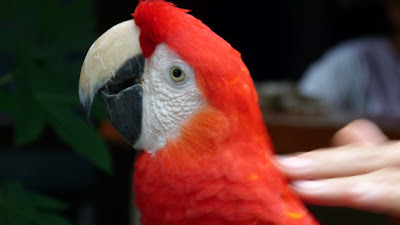 Even when macaws in the pet trade are injured, such as Bumbelina and Midorna, they could still be utilized as genetic stock in a program to reinstate wild macaws into the forests. If you know of anyone with a macaw, encourage this person to led the bird to a captive breeding program. There are so few of these birds left in the wild, every fertile adult in captivity could play an important role in saving the species over large parts of their habitats. These beautiful birds need a lot of attention and food. Would you like to help them? Feel free to make a visit, bring them a bag of nuts or a papaya. These birds consume large quantities of food, so your donations are more than welcome. Macaws live for many decades, so these birds need a lot of resources to make their lives happy. If you would like to help these birds, please visit or write. Having a disability from birth can be a terrible burden for a child and the parents. A poor child in a remote area of a poor country like Nicaragua, faces an even more difficult life than someone in a wealthy country. This poor boy, named Pablo, suffers from hydrocephalus. He has lots of problems with his body, and his parents are very poor farmers in a rural area. Pablo gets seated into his new chair. Photo by Steven Allday. As if paralysis and poverty weren't enough, he lives where only a four-wheel drive vehicle can reach. He had no wheelchair, so transporting him even to doctors and physical therapy was costly and a logistical nightmare. Somehow he must not know the heartbreak people feel when they see him, though, because he seemed generally happy, even though his horizons were not distant. Pablo is finally buckled into his new chair. Photo by Steven Allday. The folks at Campbell Street Church of Christ in Jackson, Tennessee, have been arranging wheelchair donations in Nicaragua for a long time. They even retrofit wheelchairs with seats for children. 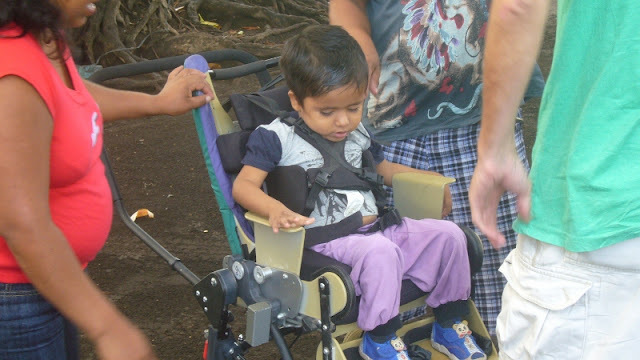 Pablo was so fortunate, because we at FUNDECI/GAIA had been holding one of the wheelchairs from the church, looking for a fitting beneficiary. His parents asked, and we took the chair out to his home to see if it fit. Pablo waves and shows delight in his new wheels. Photo by Steven Allday. This little boy had to tolerate some five minutes of strap adjustments as many hands pulled and experimented with all the buckles and ties. Eventually, he was in and secure. His mother began to move him round the yard, and his expression showed a real happiness. He could sense a liberation that this new (to him) chair has brought him. 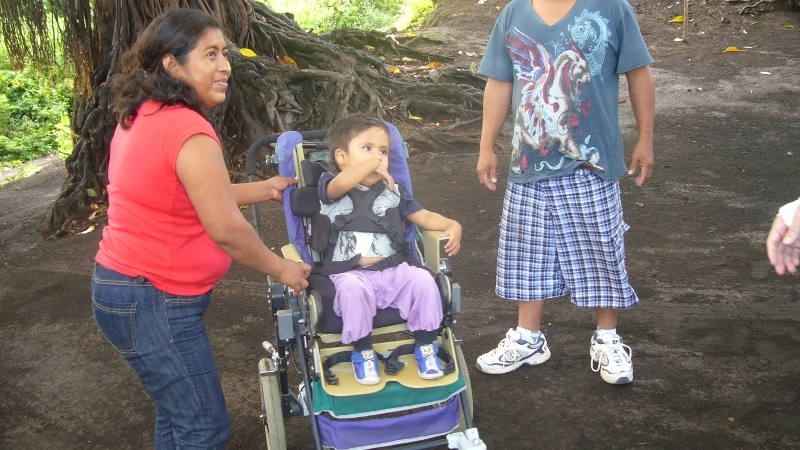 Pablo's mother is so happy to have a wheelchair for Pablo! Photo by Steven Allday. Pablo and his brother went round the yard, under the shade of a large fig tree. It surely felt to him like a fairground ride would feel: something new and sensational. His eyes glowed! 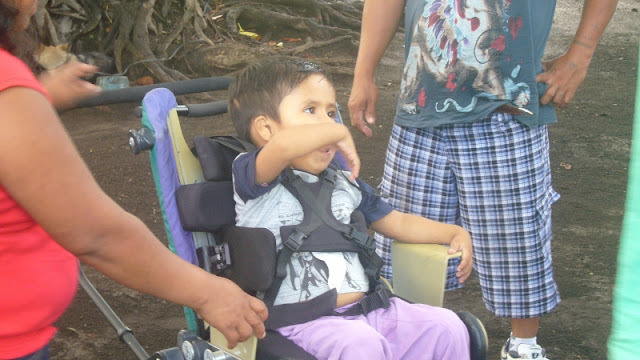 Pablo poses in his new wheelchair. Photo by Steven Allday. We want to thank all the people involved with the wheelchair donation at Campbell Street Church of Christ! This may have seemed like a very small gesture by someone in the USA, but it means a world of difference to a young, disabled child in Nicaragua. 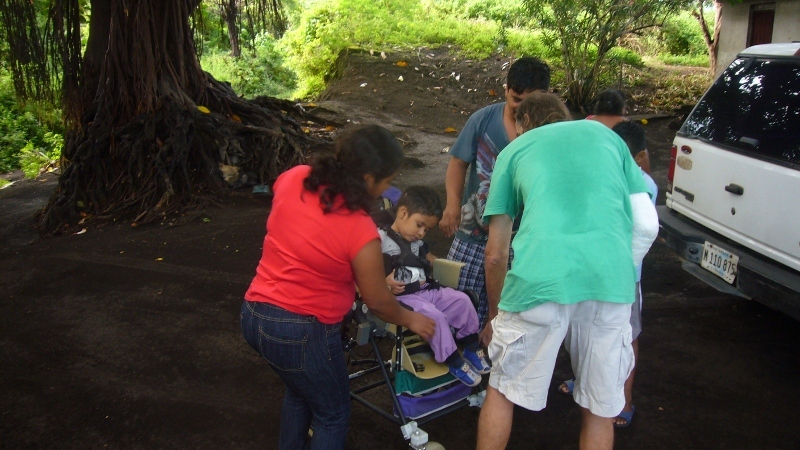 Would you like to be involved in making Nicaragua a better place for all? We receive volunteers to work on several projects related to social issues and then environment. And there are projects dealing with persons with disabilities, too. Please contact us for more information.